The Vol. 1, No. 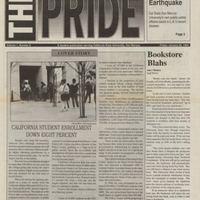 6 issue of The Pride includes articles on California student enrollment, book prices, and Student Health Services programs. January 28, 1994,” University Archives at the CSUSM Library, accessed April 18, 2019, https://archives.csusm.edu/student-newspapers/record/81.